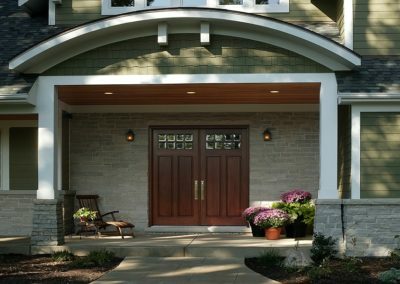 Our top-to-bottom award-winning Chicago area home remodeling project was profiled in Qualified Remodeler magazine, one of the leading national trade publications for the remodeling industry. Take a peek inside this striking transformation. Did you ever walk into an open house and think, “This house has great bones, but there are so many things that don’t work. Should we still consider buying it?” If so, you’re not alone. Many prospective home buyers like you often face that same dilemma: they’re in the market for a good home in a great area with top schools and a shorter commute to work. And then they say, “Oh, but the layout is flawed, the interior and exterior need remodeling and – by the way – the roof is leaking!” If this sounds like you, don’t lose hope. A home remodeling project – no matter the size or scope — isn’t that scary when you hire the right remodeling contractor with a proven track record of success and experience. Start by being prepared with a ton of questions when interviewing contractors for the job! Then, ask about his thorough step-by-step design, planning, budgeting and management process. When working with us, our clients aren’t limited to a few in-house designers. Instead, they gain a valuable benefit when we select the best possible design firms to partner with for their project. 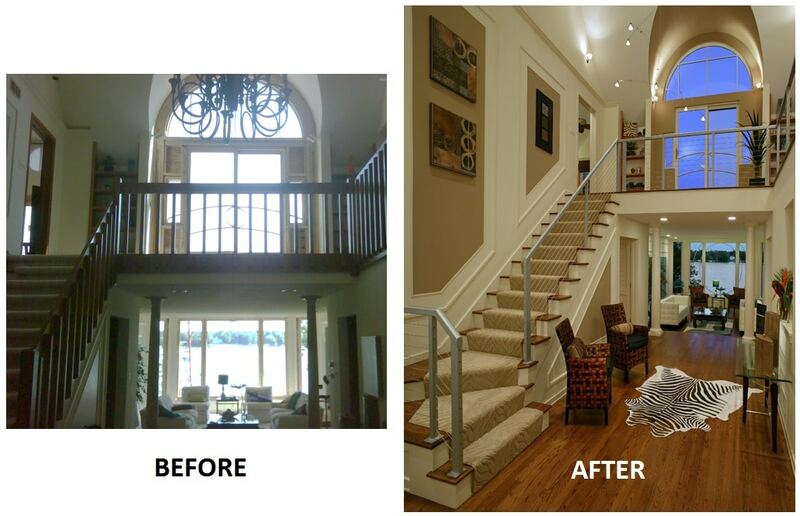 For this renovation, we worked with interior designer Vicki Ovitt and architect Ron Haas, both from Wheaton, IL. 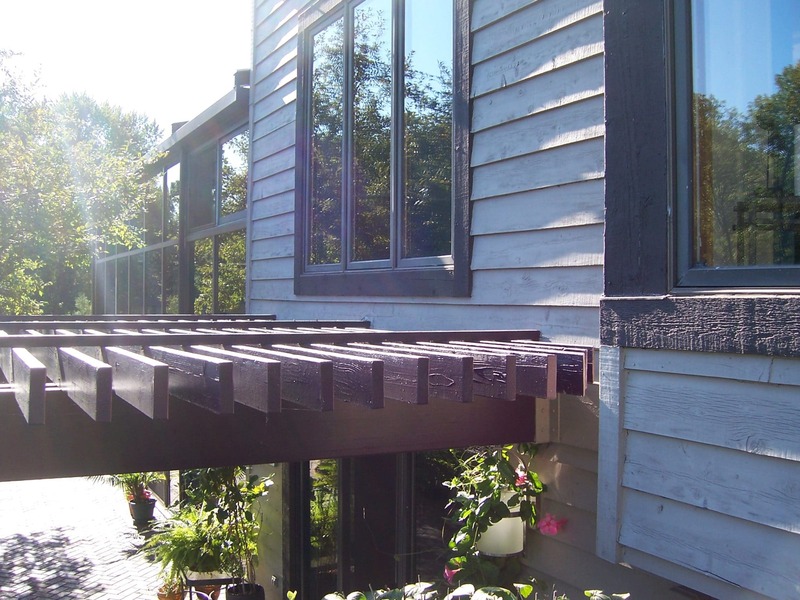 The project scope involved remodeling most of the entire home’s interior and exterior, in addition to building a new exterior main-level deck. Due to the home’s age (42 years old), there were many items in need of replacement, including the failing siding, windows, roof deck and roof deck rails on the exterior that were responsible for water leaks and unwanted maintenance. In addition to replacing the failing products, the homeowners wanted to transform the look from a dated ’70s rustic to a soft contemporary style that they desired. The homeowners were limited by the floor plan of the main- and second-floor levels. Specifically, there was no way to access the exterior to enjoy the beautiful lake view outside on the main level. There was also no way to gain access to the roof deck without walking through the master suite or second bedroom on the second floor. This called for the Southern Maryland Home Improvement Contractors to get the job done along side Donatelli Builders. Replace the exterior finishes with products that were reliable, and use lower-maintenance items where it would not compromise aesthetics. Add an outdoor living space on the first floor that was close in proximity to the kitchen, and alter the second-floor plan so the roof deck could be accessed without walking through the bedrooms. Update the interior and exterior elements to reflect a soft contemporary style. The biggest challenge was that this is a large house at over 5,000 square feet and virtually every room was affected. We used the cost-versus-value analysis extensively and needed to maintain existing items when possible. For example, there were newer counters and appliances in the kitchen and the budget would not allow for an extensive kitchen remodel. The solution was to make minimal changes by adding crown moldings to the wall cabinets for proportion and replace all doors, drawer fronts and hardware. In addition, the dark oak was altered by carefully preparing the cabinet boxes and applying a smooth spayed white finish. This allowed us to make a dramatic improvement while keeping costs below $10,000 for the entire kitchen area. The process was started by asking the homeowners to provide a wish list including “must haves” and “would like to have” items so we could evaluate what was most important. Our design/build team presented solutions in order of priority accompanied by a budget forecast giving the owners the ability to select the items that they felt offered the most value to them. The result was a dramatic whole-house renovation that revitalized a late 1970s-era lake house into a beautiful modern-day weekend residence where virtually every room received some type of aesthetic or functional improvement. 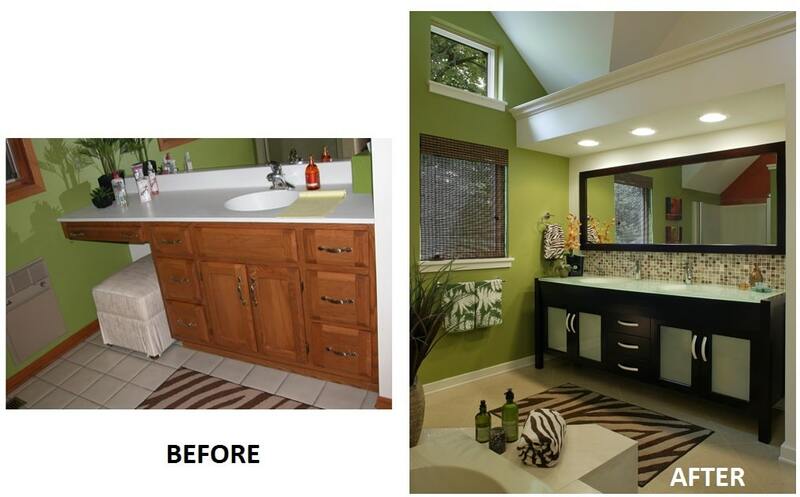 Take a look at the following before-and-after photos. What do you think of the transformation? Contact me if you would like any additional insight into how we achieved specific goals and what construction techniques we used. I’d love to hear about any home remodeling project you’re planning as well! AFTER: The existing trellis structure was removed and a new exterior raised main-level deck was installed. The glass block panels were installed and every deck board was ripped down so wood dimensions equaled glass block panel size. New aluminum cable rails replaced the existing wood rails. Existing Upper Roof Deck: The awning windows were replaced with doors and a new half-round window to provide hall access to the second-floor roof deck. 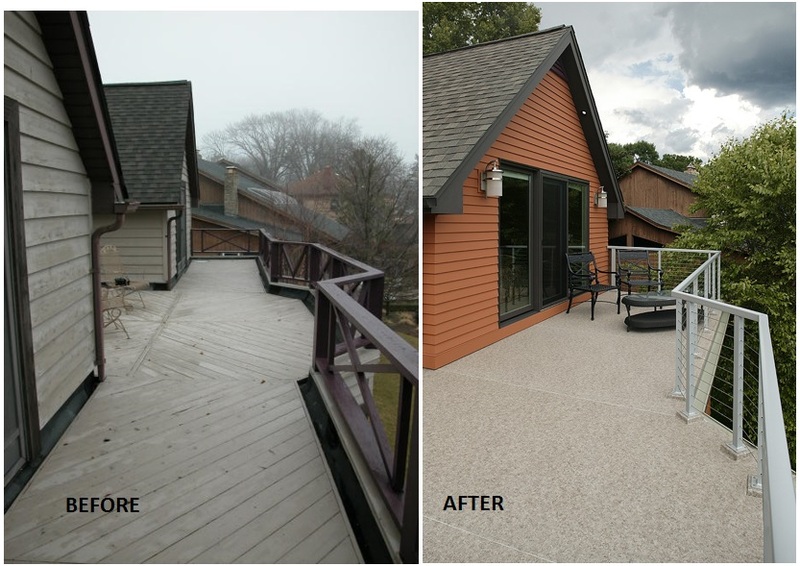 The wood flooring system was replaced with finish-quality roll roofing for reduced maintenance and a clean look. The cable rails replaced the existing wood rails. New siding features 4” exposure and mitered corners. Parapet walls removed under wood rails. Overhang was added for function and to incorporate down lighting. Wood rails were replaced with a cable rail system. Windows and doors were widened to enhance view. Trellis structure was replaced with elevated deck. Bay window was redesigned as a focal point with custom simulated divided light grills featuring a concentric ring that continued on new doors above. Bay window features concentric design, trim and siding details to complement circle motif. All exterior walls were straightened as required prior to siding installation to eliminate any waves in existing walls. 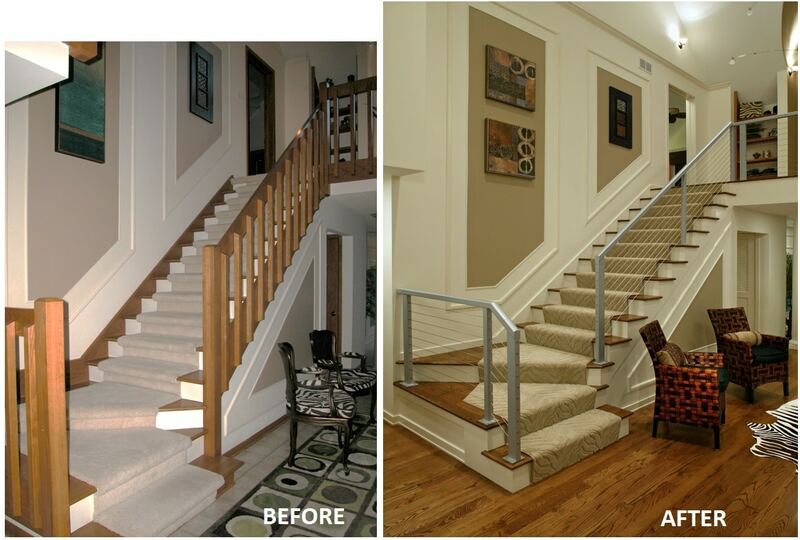 Foyer Renovations (Staircase): The heavy oak rails were replaced with aluminum cable rail. The oak stairs were replaced to improve safety and accommodate the new cable rails. Foyer Renovations (Second Floor): The awning windows were replaced with doors and a new half-round window to provide hall access to the second-floor roof deck. 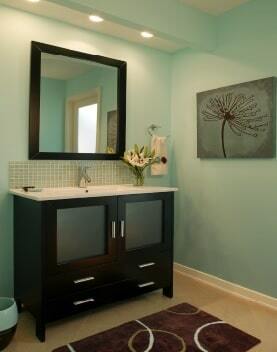 Pictured above: The master bath. Pictured above: The guest bathroom. Popcorn ceilings were replaced with smooth drywall. Crown moldings were added to the 30” tall cabinets. Replaced all doors, drawer fronts and hardware. Existing dark oak cabinets were altered by carefully preparing the cabinet boxes and applying a smooth sprayed white finish. Hand-glazed detail was added to cabinets. Pictured above: The Living Room. New Marvin window design at 6’-8” excluded transoms and multiple casements to provide the best view. Popcorn ceilings replaced with smooth drywall. All floors required leveling prior to installation of hardwood floors. Subtle curve added to landing to accentuate window design. 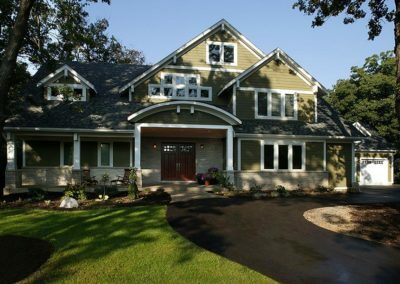 Do Home Remodeling Contractors in Hinsdale IL Need Staff Designers?